Standpoint magazine has an interesting little feature where the writers take political or cultural figures of great reputations and then knock them down. It’s fun to read although the cynical part of me says that the feature’s really there to generate clicks from outraged fanboys. This week Oliver Wiseman has taken on Hunter S Thompson, and as I’m very much an ageing HST fanboy, I will bite. Wiseman’s critique gets a lot of things right. Thompson was a degenerate, a fabulist who often missed the story or plainly made stuff up, a talented man who was swallowed into his own narcissistic mythos. There were plenty better journalists of the day who were ignored. Joan Didion and Michael Kerr could probably tell you more about the crazy times of the American midcentury than HST. All of which should be enjoyed alone, ‘outside in the warmth of a hot sun, and preferably stone naked’. To a certain man of a certain age — me in my late teens, to be specific — there was something heroic about the way Hunter S. Thompson liked to start the day. Be careful who you pretend to be, said wise Kurt Vonnegut, and perhaps HST should have taken this advice to heart. Reading the correspondence I was surprised by how much time Thompson spent at home in Owl Farm. Alcoholic artists like to get hammered alone. Other people tend to get in the way of the visions. 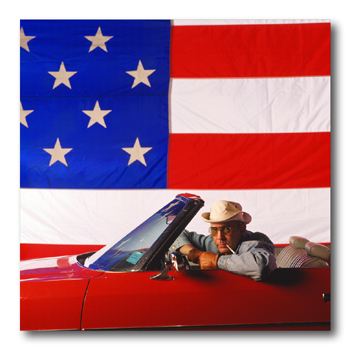 Perhaps HST shot himself because he knew he’d come to the end of his visions. No more fun, indeed. Have a look at a broadsheet feature or op-ed. Notice how overmannered and overwritten and partisan and twee and insufferable the writing is. How obsessed the writers are with clicks and culture wars. It is near a trial to read. For all the respect I have for the British press, I know there are great British journalists out there, there are probably more than they have ever been but they are still in the minority. Go from there to the Daily Beast, Longreads, or Deadspin, and you will find the experience like a warm bath and brandy after cutting your way through miles of brambles. It is just so refreshing to read journalists who write clearly and without fear. St Louis writer Sarah Kendzior, whose View From Flyover Country I’m currently enjoying, has the same quality. I’m not saying that American journalism is better than British journalism. But, well, there’s a reason there’s a Mueller investigation in the States and no equivalent over here. There’s a reason Donald Trump hates and fears the press, while British politicians fear only their political rivals. The contrast holds even in my own interest of fiction and criticism. The biggest story in Anglo-American publishing this year, the Dan Mallory scandal, was broken by the New Yorker. It could not and would not have been published in a UK publication. Americans don’t necessarily have a stronger tradition of newspapership than we do but they know how better to draw on it. And part of that tradition includes degenerate assholes like HST. The world is so dark so often that a staid recitation of the day’s horrors will cause audiences to turn the news off altogether. Journalism today has to paint in bright colors, have a sense of wit, and give up any attachments to the powerful. It’s gonzo or go home. Go gonzo or go home. What an editor. What a sensibility. The Beast has also drawn from English traditions as well, the name is of course from Waugh’s Scoop, a satire of the days when it was easier to make living as a newspaperman. These days it is not so easy. I agree with the plaintive appeals to support British journalism, I agree with paywalls, I want journalists to have good incomes and job security and I understand that all this costs. But readers can’t do everything. Writers have to write better. And writing better requires you to read, to enjoy, and to draw on tradition. Fanboyism rarely makes for great writing. But it can provide the spark that leads eventually to great writing. We get older, we put away childish things: we do not burn them. And wouldn’t it be fun to see Hunter Thompson back from the dead and covering the Trump administration? Now that would bring in subscriptions. This entry was posted on March 2, 2019 at 1:27 pm and is filed under Writing. You can follow any responses to this entry through the RSS 2.0 feed. You can leave a response, or trackback from your own site.